Running without music can be quite boring for some; a good beat can help you to push yourself. Bulky headphones like over-ears and on-ears can be cumbersome and they might make you sweat more with heat being trapped under the headphones. This is why Bluetooth earbuds and in-ears can be quite convenient for runners. Sports earbuds should be comfortable, portable enough to carry on you, and have a good sound. Some runners will also like more open design to stay aware of their surroundings. 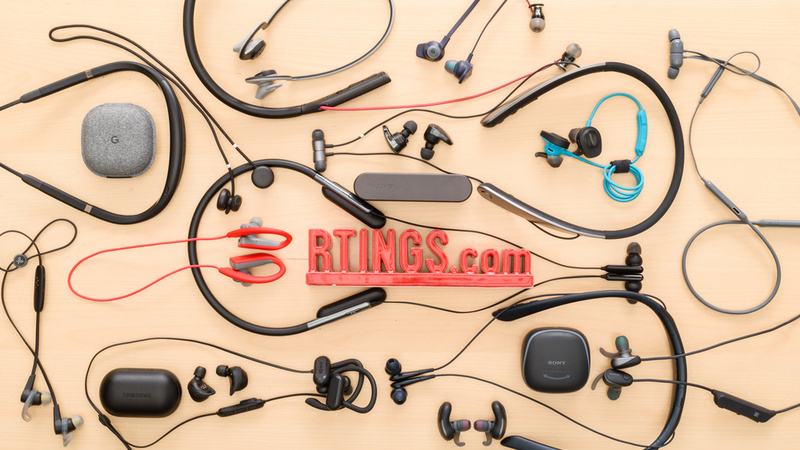 We’ve tested 286 headphones and below are our recommendations for the best earbuds for running and working out to buy in 2019. See our recommendations for the best headphones for working out, the best wireless earbuds under $100, and the best true wireless earbuds. The best Bluetooth earbuds for running we’ve tested so far are the Jaybird Tarah Pro. They’re comfortable, well-built in-ear headphones that are great for running. They have a very stable fit that will stay put during your most vigorous runs and they are rated IPX7 for advanced sweat and water resistance. The Jaybird Tarah Pro have a versatile, well-balanced sound that lends itself well not only to a wide variety of music genres, but also audiobooks and podcasts. They isolate fairly well, blocking out a decent amount of noise without hardly leaking any sound at all. They also have a very good battery that lasts for over 13 hours on a charge. It charges pretty quickly too, under 2 hours, and when you snap the magnetic earbuds together, it triggers the auto-off timer to preserve battery life. Unfortunately, they have a proprietary charging cradle that isn’t very practical. You can’t use a spare micro-USB cable when their battery dies if you don’t have the charger on you, and even when you do have the charger, its cable is very short and not very convenient. Putting the charger aside though, the Jaybird Tarah Pro are impressive wireless earbuds for sports and are sure to please runners looking for long-lasting, comfortable headphones. If you don’t want any wires in your way at all and prefer to be able to charge your earbuds with a micro-USB cable, get the Jabra Elite Active 65t. They’re durable, well-built earbuds that have a premium matte finish and are rated IP56 for dust and water resistance. They come with a good charging case and last for over 5 hours of continuous playback, which is pretty decent for truly wireless in-ears. They have good audio reproduction and have great isolation, which is perfect for blocking out disruptive gym chatter. Unfortunately, the Jabra Elite Active 65t are quite bulky and their in-ear fit may be uncomfortable for some, especially those with smaller ears. If they do fit you well though, they’re quite stable. 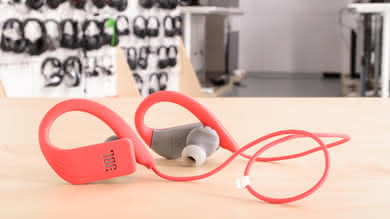 If the fit doesn’t work for you, consider the JBL Endurance Peak, which have ear hooks for added stability. If you find running with your smartphone distracting and would like the option of loading your favorite tracks directly onto your headphones, then get the Samsung Gear IconX. They may not be as rugged or as sweatproof as the Jabra Elite Active 65t, but they come with 4GB of onboard storage, so you can enjoy hundreds of songs without needing your phone or media player. They are well-built, truly wireless headphones that are super lightweight and pretty comfortable for in-ears. Unfortunately, these headphones don’t have a sweat resistance rating and tend to get clogged with sweat and debris after a while. Though they usually sound pretty decent, the clogging issue may cause a slight imbalance in loudness between the left and right earbud after only a few months of use. It is possible to restore the sound quality by cleaning out the earbuds every once a while, but headphones with higher IP ratings don’t have this issue. If you don’t mind a bit of maintenance, the Samsung Gear IconX are still great in-ears for sports with impressive stability, isolation, and cool active features. If you’re an outdoors runner who needs to remain aware of their surroundings but would still like to enjoy some background music, get the unique AfterShokz Trekz Air. Technically, they’re not earbuds; they’re bone-conducting headphones that use vibrations, so you feel bass instead of hearing it. By sitting on your temples, they leave your ears wide open so you can hear everything around you. They have a comfortable design and they don’t sit inside, on, or over your ears, so you barely feel them. Their around-the-head design with over-ear hooks makes them quite stable for sports, however, you might have to re-position them a bit from time to time. Unfortunately, their bone-conduction and open design means they don't sound as good as typical in-ear or over-ear headphones. They are also sensitive to positioning, so different head shapes might get different listening experiences. 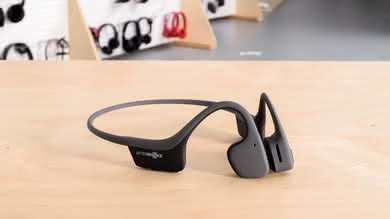 That said, if you’re concerned about traffic when running outside, the AfterShokz Trekz Air are one of the best ways to enjoy music while remaining aware of your surroundings. 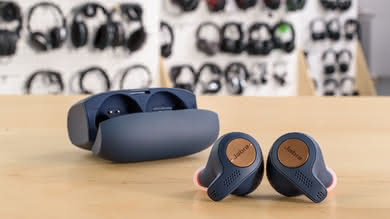 If you like the design of the AfterShokz Trekz Air but would like better sound, look at the Plantronics BackBeat Fit. 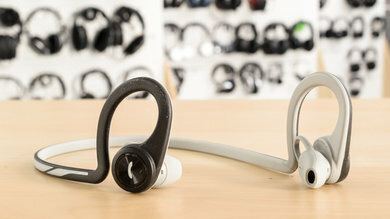 You’ll have less awareness because their in-ear fit blocks a bit of ambient noise, whereas the Trekz Air are completely open, but they sound much better overall. 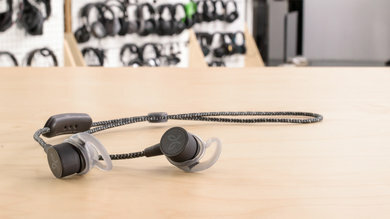 Unfortunately, the Plantronics Fit aren’t the most comfortable in-ears we’ve tested, and they’re definitely less comfortable than the Trekz Air. On the upside, they’re more portable than the AfterShokz Trekz Air, thanks to their flexible band. They can be folded into a more compact format, which is great for runners on-the-go. If you’re looking for a comfortable, stable pair of wireless earbuds that won’t break the bank, then get the Anker SoundBuds Curve; they're the best earbuds for working out in the budget category. They’re not as sweat-proof as the Jaybird Tarah Pro and don’t sound quite as good, but they still deliver decent performance for the price. The Anker SoundBuds Curve have deep, powerful bass, which is perfect for getting in the groove on a run, but they’re still versatile enough to accommodate a range of musical genres. They also deliver almost 13 hours of playback on a single charge, which is great not only for budget in-ears but among all wireless earbuds. The build quality of the Anker SoundBuds Curve isn’t as good as that of the very similarly designed Anker Soundcore Spirit X, but the SoundBuds Curve offer better value. They have a slightly better battery and offer superior isolation performance. 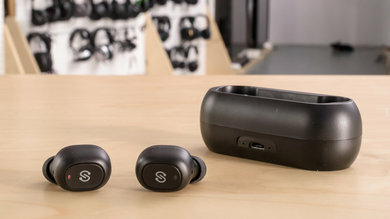 Consider the Spirit X if you really need the extra durability, but otherwise, if you’re looking for good wireless earbuds for running without busting your budget, the Anker SoundBuds Curve have got you covered. If you want budget sports earbuds with better sound quality, get the JBL Endurance Sprint. 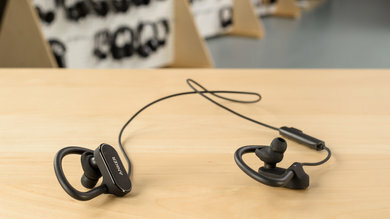 They have over-ear hooks like the Anker SoundBuds Curve, but their design is bulkier and more sweat resistant. They might not have a great battery life, but 9 hours should be enough for sports, and they have an IPX7 rating that the SoundBuds Curve are lacking. Although their touch-sensitive control scheme is a welcome feature at this price point, it feels very sensitive to the point of inaccuracy. On the upside, the JBL Endurance Sprint have decent sound and great isolation performance, making them a good choice if you’re training indoors in a crowded gym. If you’re looking for truly wireless in-ears at a great price, get the SoundPeats TrueFree. They may not be as sweat-proof as the JBL Endurance Sprint and do not have the battery life of the Ankers. However, they’re surprisingly well-designed for the price, with a solid yet lightweight build that stays put in your ears once you find your perfect fit. They sound decent and pack thumping bass, which makes them great for EDM and hip-hop. They also achieve very good isolation performance, helping you get in the zone. On the downside, their battery doesn’t last long, even for truly wireless in-ears, providing only about 3 hours of playback on a charge. All things considered, though, these truly wireless earbuds are pretty cheap for what they offer and are a great deal for runners looking to free themselves from wires. Our recommendations above are what we think are currently the best Bluetooth earbuds for running and working out to buy for most people in each price range. We factor in the price (a cheaper headphone wins over a pricier one if the difference isn't worth it), feedback from our visitors, and availability (no headphones that are difficult to find or almost out of stock everywhere). If you would like to choose for yourself, here is the list of all our reviews for sports/fitness earbuds and in-ears. Be careful not to get caught up in the details. There are no perfect headphones. Personal taste, preference, and where you use the headphones will matter more in your selection.